Most of the car accidents are due to human attitude. Since human driving attitude is hard to change, automobile manufacturers are hoping to develop a full proof technology that could reduce the occurrence of such incidents. Volvo, a famous luxurious automobile manufacturer has put much effort in developing a new technology that targets to reduce the accident on the road by enhancing the car safety features. The new technology, known as CWAB (Collision Warning Auto Brake) system utilizes both the radar signals with camera sensor to detect the front car’s distance and trigger the brake system automatically. Statistical data indicates that rear end collision is the most common accidents that involved two vehicles on the road. 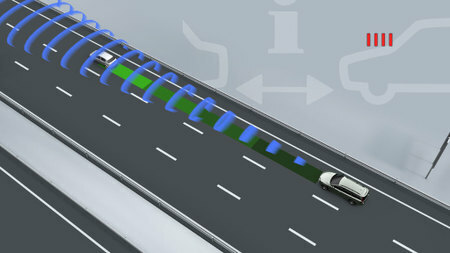 In view of this, Volvo’s innovation of a sensor that able to sense the front car distance and trigger the brake system automatically would definitely help in tackling this. The effective ranges for both radar detector and camera are around 150 meters and 55 meters respectively. When an incident is about to happen, the radar detector will be activated first followed by the shorter range camera sensor. When both conditions are met, the driver will be warned while the car break system will being activated and ready to halt. Good thing is, it has three programmable modes that suit the individual’s driving styles. The development by Volvo has been for a while since 2006 but during that time only the radar detector was being deployed. And now with the additional camera sensor, the system could be ‘smarter’ to filter out any false alarm with more precise sensing and brake activation. The technology will be implemented on its V70, XC70 and S80 by end of this year.